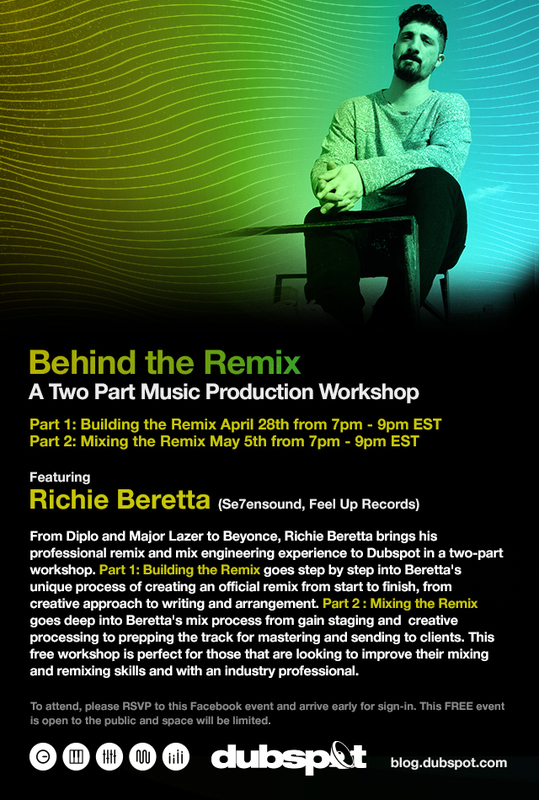 We are proud to announce a special two-part music production workshop with Dubspot Instructor, mix engineer, and DJ/producer Richie Beretta on April 28th and May 5th that will focus on mixing and remix techniques. From Diplo and Major Lazer to Beyonce, Richie Beretta brings his professional remix and mix engineering experience to Dubspot in a two-part workshop. Part 1: Building the Remix goes step by step into Beretta’s unique process of creating an official remix from start to finish, from creative approach to writing and arrangement. Part 2 : Mixing the Remix goes deep into Beretta’s mix process from gain staging and creative processing to prepping the track for mastering and sending to clients. This free workshop is perfect for those that are looking to improve their mixing and remixing skills and with an industry professional. For Richie Beretta, music is a way of life. Born in New York City, while most kids were at little league practice, Richie toyed with his dad’s 4-track reel to reel tape recorder, digital processors and vintage musical instrumentation. Eager to perform he would sneak out of the house only to sneak into clubs in lower Manhattan to play gigs with bandmates who were almost twice his age. Soon his love of music and the art of recording grew into a profession. He designed and built Sevensound Recording Company. A production company geared towards cultivating independent artists, yet sought after by artists on Major labels such as Warner Music Group, Atlantic, Universal and Universal-Japan. Beretta has toured internationally as producer and DJ and has played some of the most exclusive clubs in NYC, but will still DJ a house party. Additionally, he has produced some of the biggest names in the City’s night life including Cazwell, Cherie Lily and Amanda Lepore. Recently, he composed the soundtrack to the 2012 World Snowboarding Championship and has teamed up with Jillionaire from Major Lazer for a special production project. 2013 will be his busiest year yet, with projects involving some of NYC’s newest artists and the production of Andrew W.K’s new album.